Joseph Salvatore Altobelli (born May 26, 1932) is an American former player, manager and coach in Major League Baseball. 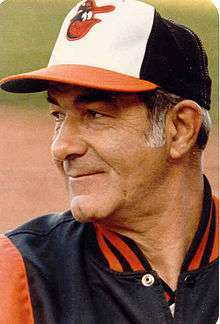 In 1983, he succeeded Hall of Famer Earl Weaver as manager of the Baltimore Orioles and led the team to their sixth American League pennant and their third (and most recent) World Series championship. Born and raised in Detroit, Altobelli earned All-City recognition in football, basketball and baseball while attending Eastern High School. He married Patsy Ruth Wooten in 1952; they had six children. As a player, Altobelli was a slugging first baseman and outfielder who enjoyed his greatest success at the AAA level. He batted only .210 in 166 games for the Cleveland Indians (1955, 1957) and Minnesota Twins (1961), with five home runs and 28 runs batted in. However, he was frequently in the double-digits in homers as an AAA player. As a member of the Montreal Royals, he led the 1960 International League (IL) in homers (31) and RBI (105). He batted and threw left-handed. In 1951, as a member of the Daytona Beach Islanders, he ran up a 36-game hitting streak that stood as the Florida State League record until Harold Garcia's 37-gamer for the Clearwater Threshers in 2010. In between, Altobelli played winter baseball in Venezuela in a span of three seasons. He claimed a batting title with a .378 average for the Gavilanes de Maracaibo champion team in the 1955–56 season, and later posted two solid campaigns with the Oriente (1956–57) and Valencia clubs (1960–61). In 1966, Altobelli began an 11-year apprenticeship as a manager in the Baltimore farm system, culminating in six seasons (from 1971 to 1976) managing the Rochester Red Wings of the IL. During his tenure, the Red Wings finished first four times. In 1977, Altobelli got his first big league managing job, leading the San Francisco Giants. Although his 1978 club finished 16 games above .500 and in third place in the National League West Division, Altobelli was dismissed in 1979, his third season, with a mark of only 225–239 (.485) as Giants' manager. He then joined the New York Yankees as manager of their AAA farm club, the Columbus Clippers. After another first-place IL finish in 1980, Altobelli became a Yankees coach from 1981 to 1982, working under Gene Michael, Bob Lemon and Clyde King. Before the 1983 season, Altobelli was named successor to Weaver after his 14½-season career as Baltimore's manager. Altobelli led the O's to 98 wins, the AL East championship, then a three-games-to-one triumph over the Chicago White Sox in the American League Championship Series. The Orioles then dominated the Philadelphia Phillies in the 1983 World Series, winning in five games. The Orioles fell to fifth in the AL East in 1984, despite playing eight games over .500. In May 1985, when they continued to tread water at 29–26, Altobelli was let go. Weaver came out of retirement to win 53 of the remaining 105 games. Altobelli then returned to coaching. He worked with the Yankees again (from 1986 to 1987), then served under Don Zimmer with the Chicago Cubs from 1988 to 1991, and filled in as interim manager for one game when Zimmer was fired in 1991 before being replaced by Jim Essian. He then returned to Rochester and took over as general manager of the Red Wings in 1991, a position he held for three years. He then served as special assistant to the club president until 1997. In 1998 he began serving as color commentator for Red Wings home-game broadcasts. In early 2009 he announced his retirement, making 2009 the first year he was out of organized baseball since 1950. ↑ "Detroit Free Press All-PSL/Detroit — 1940s". DetroitPSLBasketball.com. 1999-02-22. Retrieved 2013-11-06. ↑ Biographical Dictionary of American Sports: A-F. Google Books. 1932-05-26. Retrieved 2013-11-06. 1 2 3 4 5 6 7 "Baseball Reference – Managerial career". ↑ Jaffe, Chris (June 27, 2011). "Unusual midseason managerial departures". The Hardball Times. Retrieved December 3, 2016. ↑ "Altobelli calls himself out after 59 seasons". Democrat and Chronicle. 2009-03-09. Retrieved 2013-11-06.